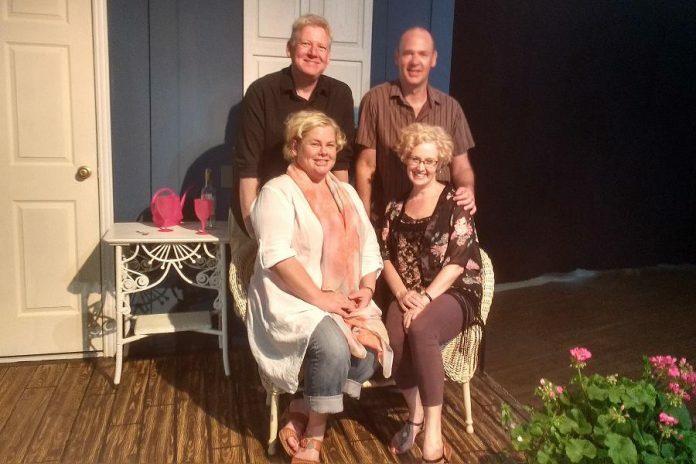 One of the top theatre companies in the Kawarthas, Globus Theatre at the Lakeview Arts Barn in Bobcaygeon remains one of my favouite theatre experiences of the year. 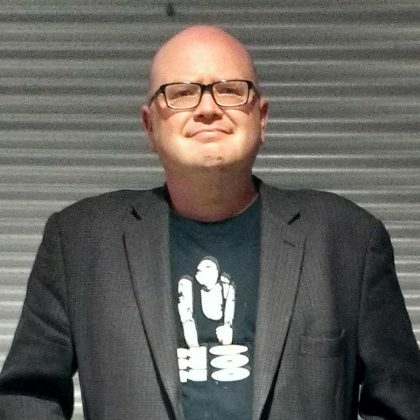 This week, their much anticipated summer season opens with the quirky comedy Buying the Moose by London Ontario playwright Michael Wilmot. Directed by and costarring Globus’ artistic director Sarah Quick, Buying the Moose also features Globus’s artistic producer James Barrett along with Dora award winner Lisa Horner and Matthew Olver. Buying the Moose is a quick and witty “he said/she said” play about two couples, one in crisis and the other caught up in their chaos of misunderstandings and anxieties. A truly funny production, Buying the Moose is about the ways that men and women communicate — or better yet miscommunicate — with one another. When Betty (Sarah Quick) returns from early from a three-day business trip on the eve of her fifth wedding anniversary, she comes home to find her husband Rob (James Barrett) neck deep in an awkward situation beyond explanation. Fleeing from the house, Betty is left wondering just what sort of deviant she’s been married to, while Rob insists that it’s not as bad as it seems. The next morning Rob’s brother Greg (Matthew Olver) comes over to find out just what happened the night before, while Betty goes to cry on the shoulder of her sister-in-law Cheryl (Lisa Horner). As Greg and Cheryl probe for answers of what happened, truths start to come out and nothing really is what it seems. Is Betty married to a pervert? Does Rob really do the “plastic fantastic”? Was Rob really doing it all for Betty, and if so what in the world was his strange misguided logic? Just who is the mysterious Susan, and what is this moose that Cheryl keeps taunting Greg about? It’s an afternoon of booze, moobs, and tattoos in a modern comedy of errors. Although the plot is highly absurd, there’s a certain truth to the way that the characters in Buying the Moose communicate with each other. Most obvious is the lack of communication between men and women. Built upon misunderstandings and assumptions, much of the plot revolves around Rob’s sweet yet stupid ideas, and Betty’s inability to allow Rob to explain himself. It’s the age-old dilemma men and women have always faced: one spouse comes up with a ridiculous idea the other is unable to comprehend. In the case of Buying the Moose, the situation is so outrageous that it threatens a five year marriage between two likeable people. However, as the two pairs of spouses talk about their marriages, other examples of the differences between the mentalities of the sexes are revealed. What’s refreshing about this play is that at no point does the playwright go out of his way to demean one or the other gender. The play is not so much about the battle of the sexes as much as it about pointing out how ridiculous and irrational human beings can be — especially when it comes to dealing with each other. When: Saturday, July 1, 2016 at 2 p.m. & 8 p.m.; Tuesday, July 5 – Saturday, July 9, 2016 at 8 p.m.; Thursday, July 7, 2016 at 2 p.m. Written by Michael Wilmot, directed by Sarah Quick, and starring Sarah Quick, James Barrett, Lisa Horner and Matthew Olver. A 3-course table d’hôte menu is available at 6 p.m. prior to every evening performance (reservations required). For tickets, visit the box office at Lakefiew Arts Barn or call 705-738-2037. The play also looks at the different ways men and women bond. The conversations between Greg and Rob often break down into somewhat awkward examples of brotherly love, while Cheryl and Betty relate to one another as two women who are in love with two goofy brothers. You can feel a genuine bond between the characters throughout the show, which keeps the show light and friendly instead of mean and cynical. But there is a slight meta element to the show that attests to the bonds created between the actors on stage. In reality, both pairs of spouses are played by real-life couples, allowing a natural element of chemistry and playfulness between them. As fixtures of Globus’ yearly productions, James and Sarah naturally play off of each other beautifully and regular audience members come back again and again to see the two perform with one another. In Buying the Moose, they extend that natural chemistry to the other real-life couple Matthew and Lisa, and you can also tell that the four actors genuinely like each other. Despite the tears and the mentions of revenge and perversions, the guy talk and girl talk seems so natural and real that, no matter how inane the misunderstandings become, you almost believe this is really happening in front of you. The result is a genuine comedy delivered by likeable performers. Buying the Moose is the perfect opening for what is sure to be another remarkable season at Globus Theatre. It’s exactly what an audience wants from a summer show and worth the drive to Bobcaygeon. The show is funny and friendly with just enough kink to keep things interesting, but without being twisted enough to offend anyone. For anyone who has ever had a misunderstanding with their partner (and let’s face it, we all have), you are going to find something to laugh about in Buying the Moose. Buying the Moose runs until July 9th at Globus Theatre at the Lakefield Arts Barn, with dinner available before evening performances. For more information and tickets, call the Globus box office at 705-738-2037 or visit www.lakeviewartsbarn.com.